Pita Nikolas Taufatofua became the first star of the Rio Olympics, thanks to his opening ceremony entrance. Taufatofua came out during the parade of nations holding the Tongan flag while shirtless and drenched in oil. Taufatofua and his chiseled, glistening body quickly became an internet sensation for the typically overlooked nation in the Olympics. 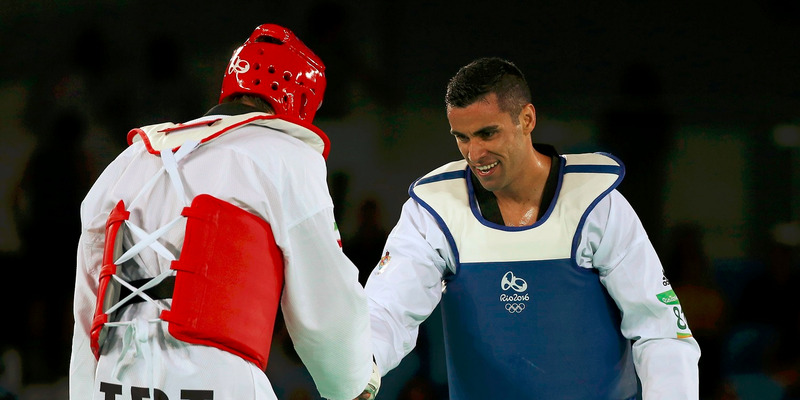 After the opening ceremony, however, Taufatofua had a long wait until his first taekwondo match of the games. And it came and went quite quickly. On Saturday, Taufatofua lost to Iran's Sajjad Mardani 16-1 in his first-round fight, thus abruptly ending his Olympic competition. Taufatofua remained upbeat, however, giving an amusing recap to Wall Street Journal's Ben Cohen and Joshua Robinson. "I thought I was the best in the world. [Mardani] proved me otherwise. He did it very quickly, as well." "I got a point — and it was the happiest point I've ever had." Taufatofua was happy throughout, even smiling after he had lost. Mardani noted it, too, saying afterward, "Even though he lost, he was happy." Despite the loss, Taufatofua told WSJ that he plans on going out with a bang at the closing ceremony on Sunday. "Don't blink or you'll miss it."